For spice rub: Mix all ingredients in small bowl. For glaze: Mix first 8 ingredients in small saucepan. Bring to boil over medium heat, whisking until smooth. Cool to room temperature. Do ahead: Spice rub and glaze can be made 1 day ahead. Cover and store spice rub at room temperature. Cover and refrigerate glaze. Rewarm glaze just until pourable before using. Spray grill rack with nonstick spray and prepare barbecue (medium heat). Sprinkle spice rub generously over both sides of pork chops (about 1/2 tablespoon per side), pressing to adhere. Place pork chops on grill, cover, and cook 5 minutes per side. Brush generously with glaze. Move to cooler part of grill and continue to grill, uncovered, until cooked through, brushing frequently with glaze, about 3 minutes longer per side. Rub a Pork Loin with oil and salt and the rub mixture. Sear on a hot grill to an internal temperature of 155 degrees. Combine apple juice and chicken stock. Boil ancho peppers, remove seeds, chop in blender and add to stock mixture. Saute onion and add to Bourbon. Reduce until almost all liquid is gone. Add 1 C Brown sugar and reduce by 1/2. Serve with sliced pork on Hawaiian rolls. 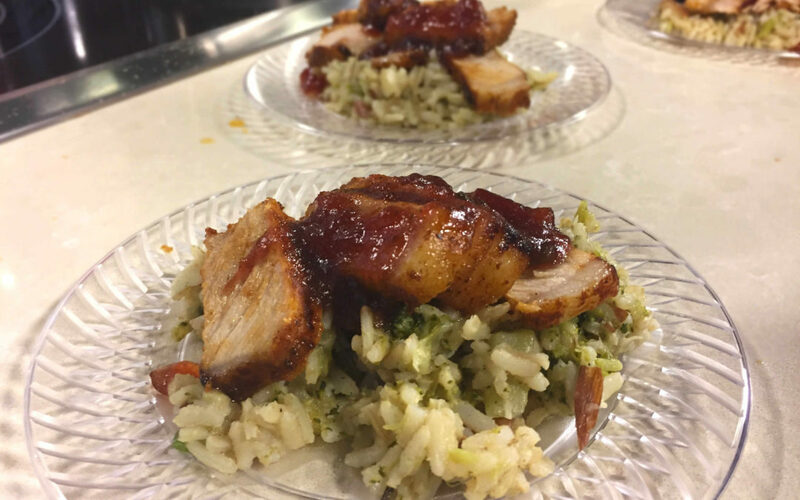 Chef Alec Naman and Chef Tom Houle won Best Entree with this recipe in the People’s Choice at the Chef’s Challenge sponsored by the Bay Area Food Bank!